We’d love your help. 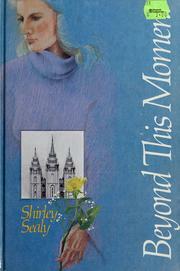 Let us know what’s wrong with this preview of Beyond This Moment by Shirley Sealy. To ask other readers questions about Beyond This Moment, please sign up. Janey leaves her Utah Mormon home to stay with inactive relatives in CT to recover from the death of her fiancé Kip, 3 days before their wedding. She meets non-member Kelly Devereaux and they fall in love, get engaged, break it off, get re-engaged. This is a semi-reasonably good book if you're Mormon. Sealy uses lots of Mormon terms. It's sentimentalized and idealized especially at the end. I think Mormon fiction has rom for improvement if this is typical of the genre. (written in 1978 when the g Janey leaves her Utah Mormon home to stay with inactive relatives in CT to recover from the death of her fiancé Kip, 3 days before their wedding. She meets non-member Kelly Devereaux and they fall in love, get engaged, break it off, get re-engaged. This is one of my ALL TIME FAVS!!!! I know parts of it can be cheesy... but I can't help but love it!!!! My mom got the book as a young teenager after it first came out. When I became a young teenager she pasted it down to me. I've read it at least once a year since then!!!! It helped me to always keep my head up and know that happy endings can be possible!!!!! Hopelessly dated, hopelessly preachy. I was given this book as a Christmas gift in probably 9th grade, and I loved it back then because I was still very Mormon. But I was still uncomfortable at how preachy the author is, especially when it comes to women being subservient to men. And reading it now makes me offended to my very core. Great love story of one who overcomes struggles. Once you make friends with pain, your pain works for you and not against you. When one is converted he gains knowledge very rapidly and sometimes passes those who have had the truth around them all their lives. When I read this, I really liked this book... I was 16. As far as LDS Authors, I am not a fan. Even back as a teenager. However, I remember liking Shirley Sealy. I haven't dared re-read them, as I enjoy the small happy memories I have of her books. Loved this book! It was written by a Mormon author,so naturally I KNEW it was going to be good! And my mom recommended it to me...I couldn't stop reading! Charming, a sweet love story, but predictable. I really liked this book and it showed that good, moral, relationships ARE possible!